One of the many food centres in Singapore. 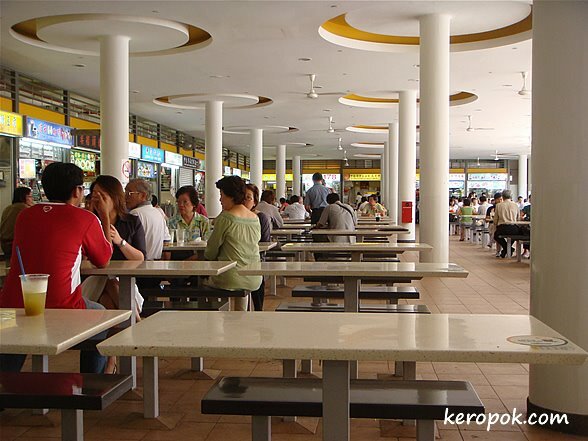 This is the Tiong Bahru Food Centre, one of the more popular ones. What was the most memorable food you ate this week? would be the handmade hokkien noodle i had yesterday. most enjoyable...hmm..cos of the company i was in. handmake hokkien mee sounds good! yes, eating with family and friends is always enjoyable. Since summer weather is creaping in, I've been eating a lot more salads for lunch and/or dinner. Had a wonderful Turkey/Mediterranean salad made with pickled red cabbage and carrots, cucumbers and tomatoes, romaine lettuce and feta cheese. Yummy!